Albert and Samuel are given $10,000 each by their grandparents. Albert puts his money into the stock market immediately, earning 5% interest each year. Samuel holds onto his money for 2 years, before also investing in the stock market at the same interest rate as Albert. After 4 years, how much more money does Albert have? Albert’s money after 4 years is equal to 10,000 x (1.05)4, according to the interest equation FV = PV*(1+I)n, where FV is future value, PV is present value, I is interest rate, and n is number of years. Likewise, Samuel’s money value is 10,000 x (1.05)2, with the only difference being the number of years. Taking the difference of these two values, we find that Albert will have about $1130 more after 4 years. A seller gives a 10% discount to a customer who pays cash. What is the marked price of an item for which the customer pays $225? John, Jack and Jason share an amount in the ratio of 4:3:7, respectively. If Jason received $32 more than Jack, what is the total amount they shared? A car starts from a static position and accelerates uniformly until it reaches a certain speed. If five cars reach the following speeds in the given amounts of time, which car will have gone the farthest distance after 1 second? This can be solved using the formulas of kinetics, but may require some time. However, there is an easier way of solving this. A uniform acceleration implies that the speed increases linearly. So, at the end of the first second, the speed for the first car will be simply 60 / 4 = 15 mph, which is the same for the answer choices B and D as well. The speed after 1 sec for choice C is higher than 15 mph, and that for E is lower than 15 mph. So, the car in C has the highest speed after 1 sec. Since its average speed over this 1 sec period is higher than the rest of the cars, it must have traveled more distance than the others during this period as well. There are 5 white, 7 red and 8 black balls in a box. If you are blindly picking up balls from the box, what is the minimum number of balls you need to take out of the box to ensure that you have at least 2 balls of the same color? After the first ball is picked, the second may not be the same color. After two balls picked, the third may still be a different color than the first two (since there are a total of 3 colors). But when the fourth ball is picked, it must match one of the prior colors. Therefore, picking 4 balls will ensure that you have at least one set of 2 balls with the same color. The numbers 5, 7, 8 do not matter here (they could matter if these numbers were lower, or the number of balls picked were higher). 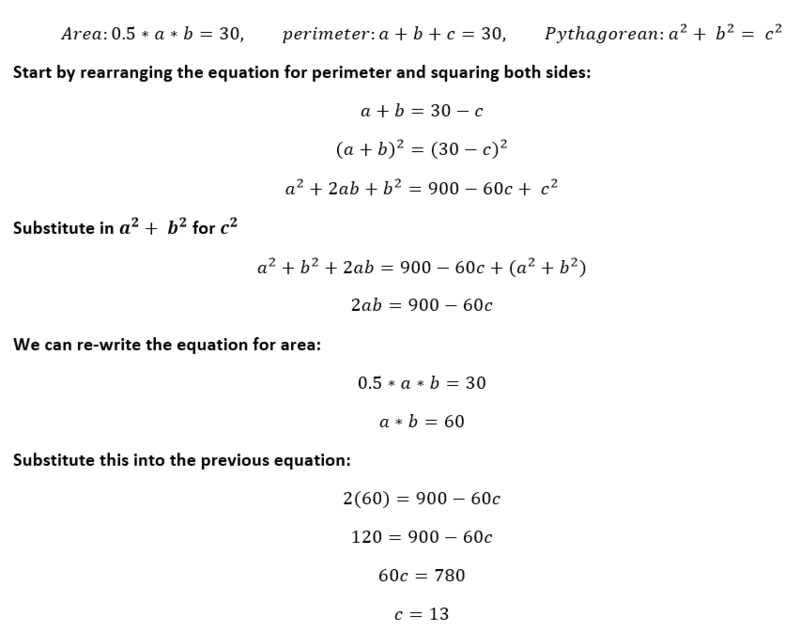 If we denote the hypotenuse of the triangle as c and the two other sides as a and b, then the values of the area and perimeter can be written as (1/2)ab = 30 and a + b + c = 30. We have three unknowns but two equations so far. However, a right triangle also follows the relation a2 + b2 = c2. We can now solve these three equations and obtain c = 13. However, the “spirit” of the problem is not checking whether you can solve this system of 3 equations (which is pretty complicated!) – instead, this problem is trying to see if you can come up with a “shortcut” to get to the right answer. Since both the perimeter and area are both nice, whole numbers, we can conclude that the lengths of the sides are also nice, whole numbers, most likely from one of the “special” triangles that we know about (eg. 3-4-5, 5-12-13) or a similar triangle. We can immediately see that the sides of the 5-12-13 triangle add up to 30. The area of the 5-12-13 triangle is 30 as well, and we can thus get to the correct answer without doing any solving at all. The work is shown below for your convenience, however. 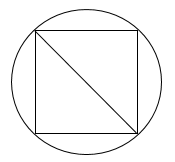 What is the maximum perimeter of a square that can fit inside a circle of radius 5 cm? As can be seen from the figure below, the diagonal of the square is equal to the diameter of the circle, which is 5×2=10 cm. If the length of one side of the square is x, the diagonal is given by √2 x. Therefore, √2(x) = 10 -> x = 5√2 and the perimeter is 4 × 5√2 = 20√2. In a certain course, the Professor has two different grading policies, from which he picks the best. The first policy is to put 40% and 60% weights, respectively, on the midterm and final exams. Under the second grading policy, these weights are 50% each. A student has scored 85% on the midterm, and needs to score at least x% on the final to make a B (a total of 82%). What is the value of x? For a grade of B, either the condition 85 × 0.4 + x × 0.6 ≥ 82 needs to be met under the first policy, or the condition 85 × 0.5 + x × 0.5 ≥ 82 needs to be met under the second policy. These two conditions yield x ≥ 80 and x ≥ 79, respectively. Since the minimum value of x is to be computed, we pick the lower of these two bounds, which is 79. Which of the following data sets contains the smallest variance? This can be done by computing the variance of each of these expressions. Also, by inspection, it can be seen that the numbers in D vary by the least amount from each other.